PFC believe that the British state’s failure to uphold the principle that no one is above the law was the single greatest factor creating and prolonging the conflict in Ireland. While each and every party to the conflict in Ireland bears responsibility for the human rights abuses it inflicted over 35 years, the PFC believes the state has a special responsibility to admit its own illegal acts. The PFC believes that, at a time of civil conflict, it is more important – rather than less – that the state upholds the principle underpinning every democratic state: that no-one is above the law. We believe that the British state’s failure to uphold this principle was the single greatest factor creating and prolonging the conflict in Ireland. We believe that through abuses such as state collusion, shoot-to-kill, the use of lethal force (e.g. 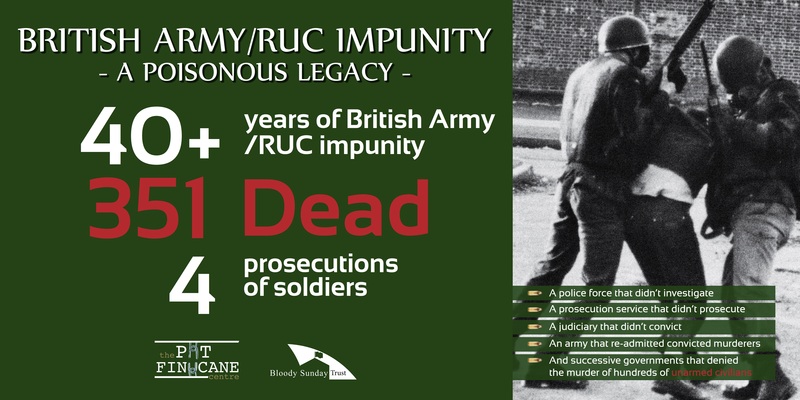 the events of Bloody Sunday), plastic and rubber bullets and through its failure, through the courts, to hold state forces responsible, London abandoned its duty to its citizens and should now be held accountable.